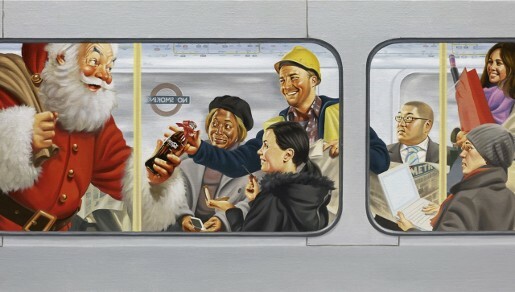 Coca-Cola have commissioned Swedish artist Mikael Erikkson to recreate their traditional images of Santa Claus, updating the work done by US artist Haddon Sundblom in the 1930s. Three oil on canvas paintings have been adapted for high impact 96 and 46 outdoor advertisements. Running in tandem with ‘The Holidays Are Coming’, the first outdoor creative sees Santa getting his famous ‘Coca-Cola’ truck ready for Christmas. The second burst of TV in the campaign begins on 1st December with the replacing of ‘The Holidays are Coming’ with the return of the celebratory ‘Greatest Gift’ in 30 and 60 second TV spots. In parallel, Erikkson’s next two Sundblom-inspired outdoor executions are unveiled, this time Santa is giving gifts of ‘Coca-Cola’ to a Christmas shopper in the High Street, plus a group of travellers on the underground. 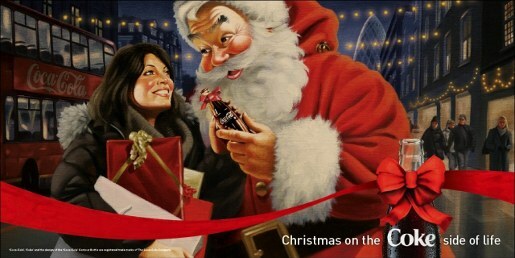 The Holidays Are Coming and Greatest Gift outdoor campaign was developed at Mother London. Mikael Eriksson is based at Rithuset, an illustration, design and animation studio in Stockholm.